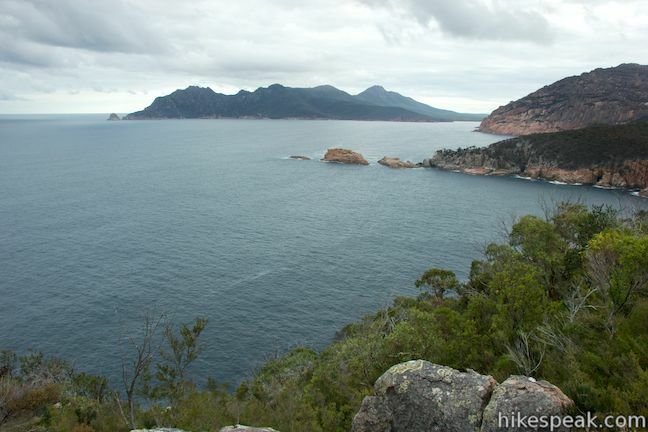 Freycinet National Park preserves a picturesque peninsula on Tasmania’s east coast. 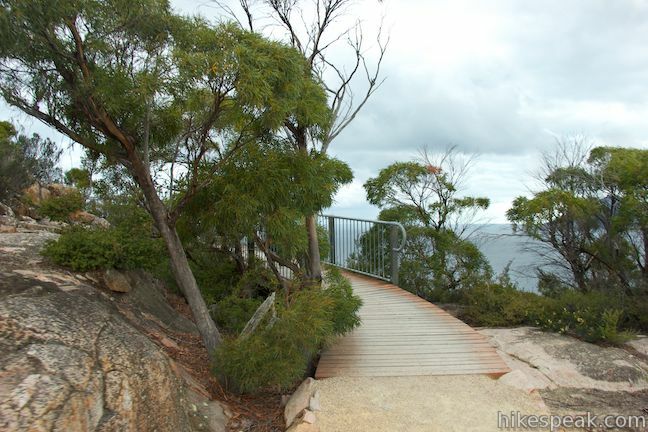 The park’s beaches are the pride of Tasmania, and if you’ve got slightly loftier ambitions, and you can get a great overview of the peninsula from Cape Tourville. 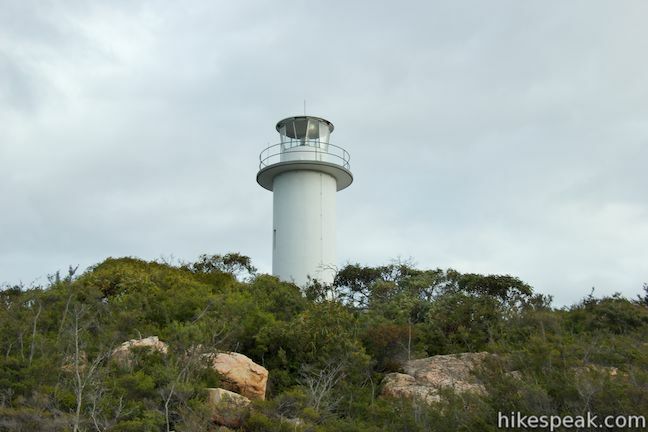 An easy 600-meter long trail loops around this promontory on the peninsula’s east coast, crossing 100-meter tall granite bluffs to reach the Cape Tourville Lighthouse, a naval beacon on the point. 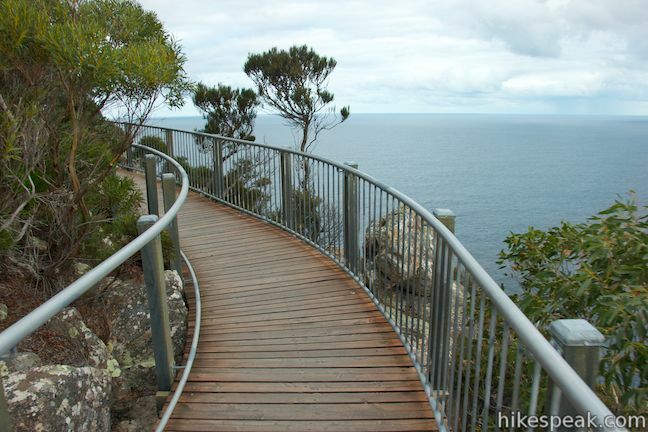 Cape Tourville is listed as one of Tasmania’s 60 Great Short Walks and certainly offers a lot of views for just a little bit of effort. 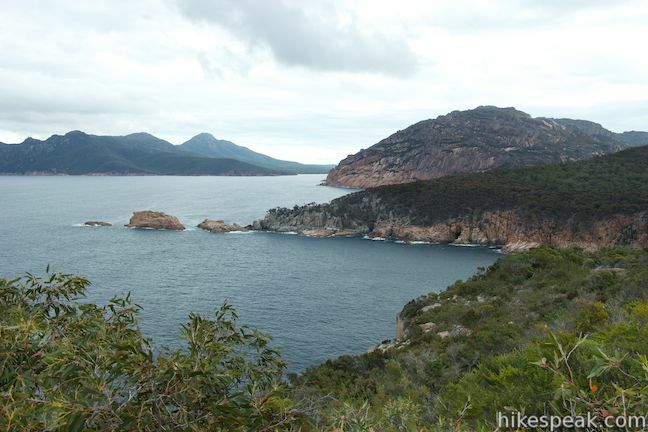 Start from the car park at the end of Cape Tourville Road and take a dirt trail a couple meters to a junction at the start of the loop. 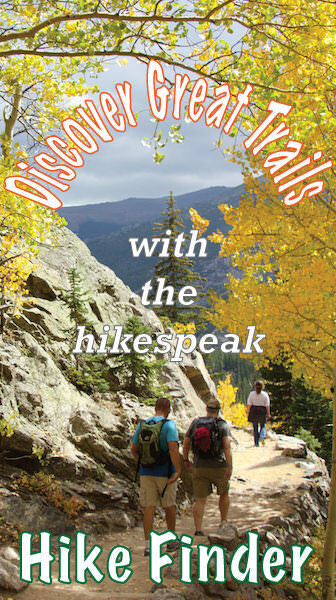 An arrow will direct you to turn right to hike the circuit in a counter-clockwise (anti-clockwise) direction. 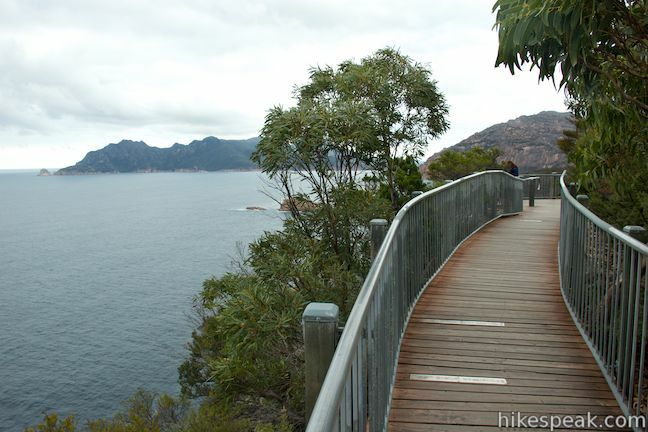 The dirt trail continues uphill through brush until it reaches the coast, where the trail becomes a wooden boardwalk that runs along the top of the sheer cliffs at the end of Cape Tourville. 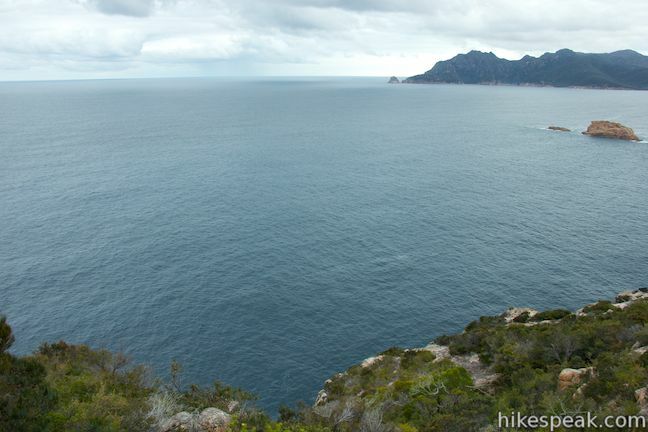 Before reaching the lighthouse, you will come to an overlook on the right that looks south down the Freycinet Peninsula. One of the loop’s info panels sits atop the safety railing, marking the landmarks in the view to the south. 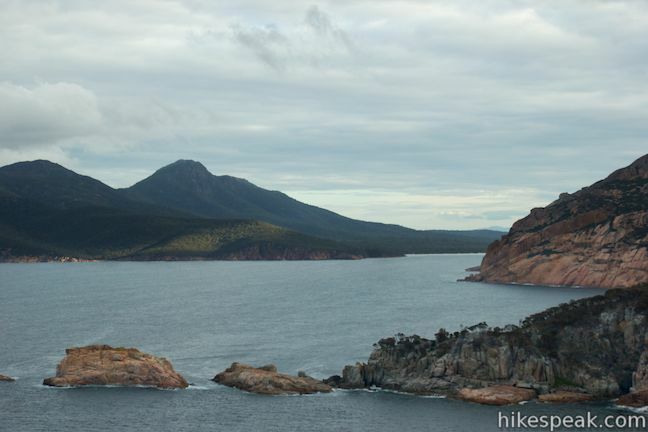 Carp Bay and Sleepy Bay lie just south of Cape Tourville, divided by a granite point. 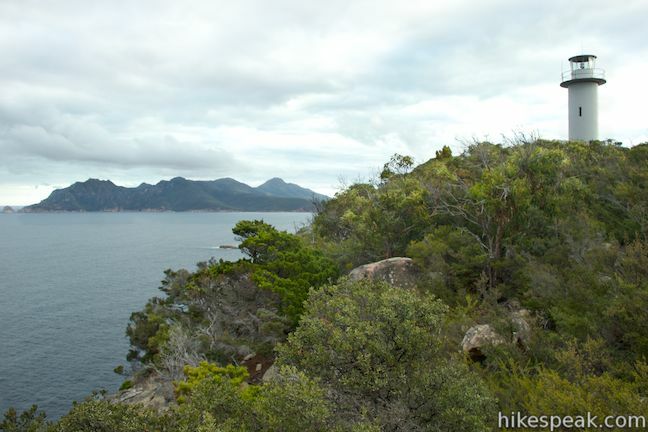 The unmistakable form of Wineglass Bay, cups the coastline beyond that. 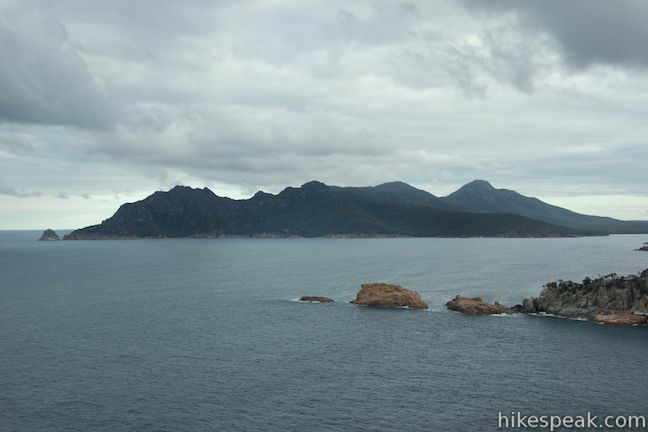 Mount Graham (579 meters) and Mount Freycinet (620 meters) rise up behind Wineglass Bay and are part of the Hazard Mountains that crown the Freycinet Peninsula. 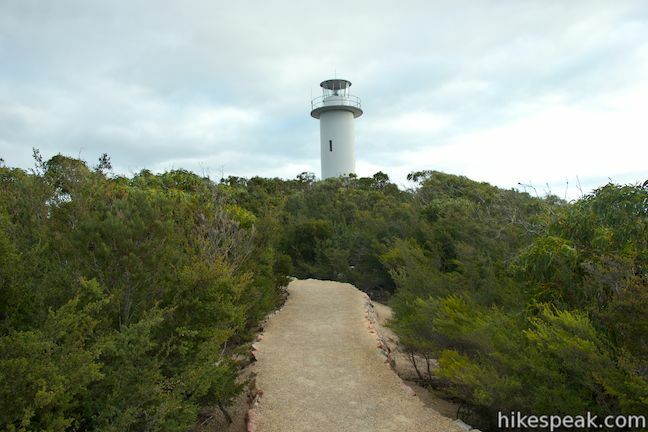 Beyond Wineglass Bay, the coast runs southeast to Cape Forestier where you’ll spot Lemon Rock, a small island just off the point that does not sour the view. 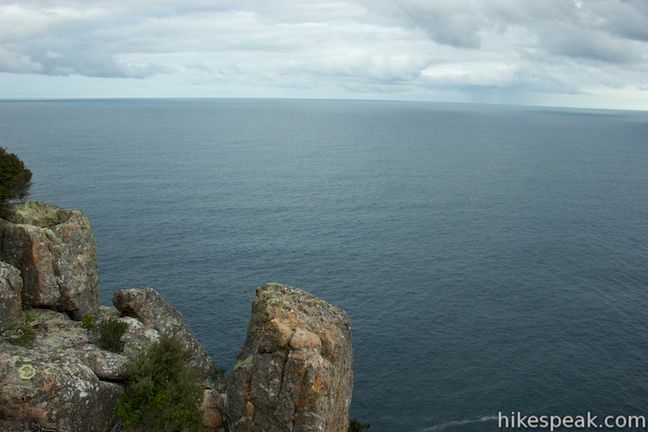 Farther to the east lies a vast expanse of the Tasman Sea. 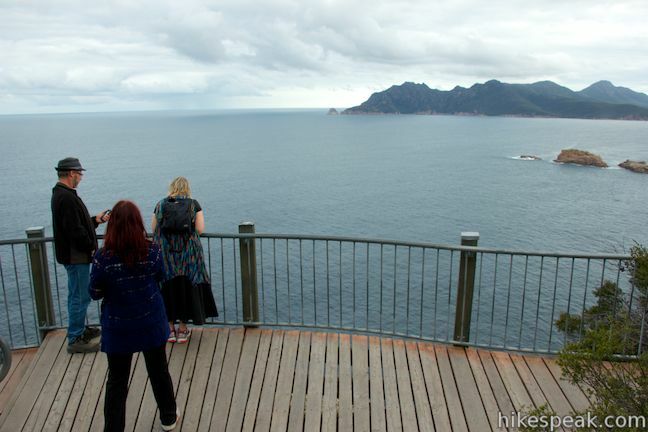 These are migration waters for humpback whales and southern right whales, so keep an eye out for wildlife. 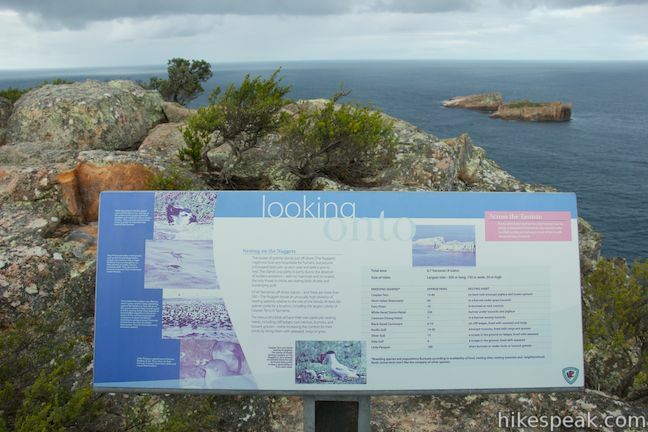 If you time your visit right, you can spot these big whales, as well as dolphins and seals in the waters below Cape Tourville. 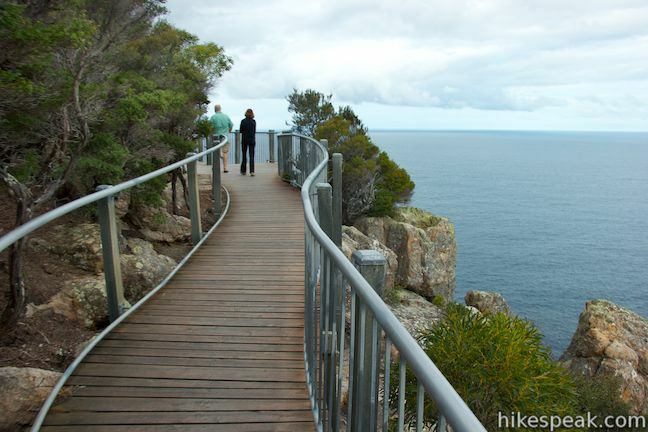 Continue up the boardwalk as it curls to the left toward the end of the cape where you will come to a junction with a dirt trail that ascends to the left. 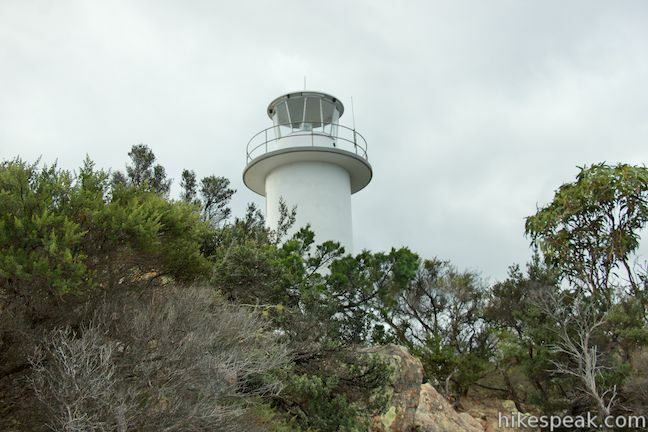 This is the path to Cape Tourville Lighthouse. 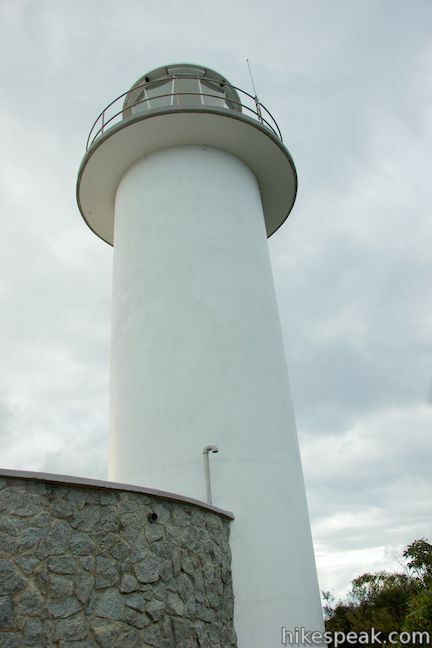 Take a short walk up this spur to reach the base of the 11-meter tall lighthouse made up of a white tower with a stone building attached to the base. 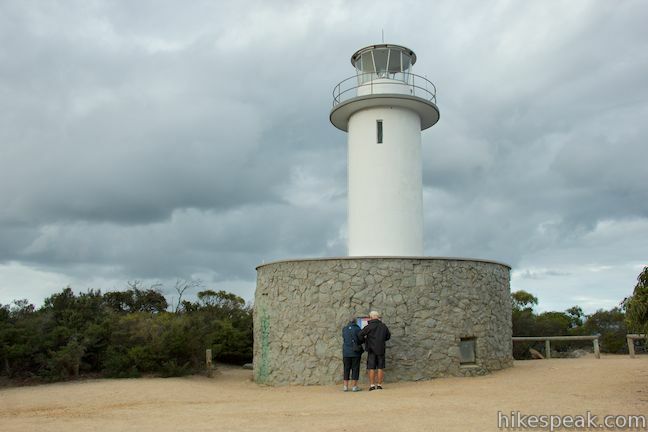 The unmanned light station was built in 1971 and sits at the crest of Cape Tourville at an elevation 126 meters, allowing it to cast a beacon a great distance up and down the east coast of Tasmania. 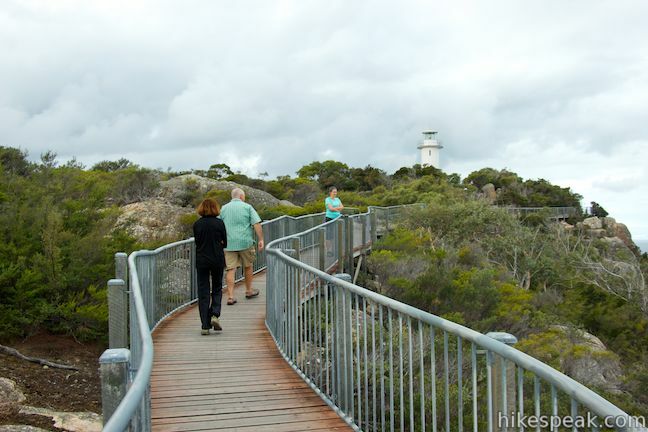 Walk back down from the lighthouse and continue with the loop. 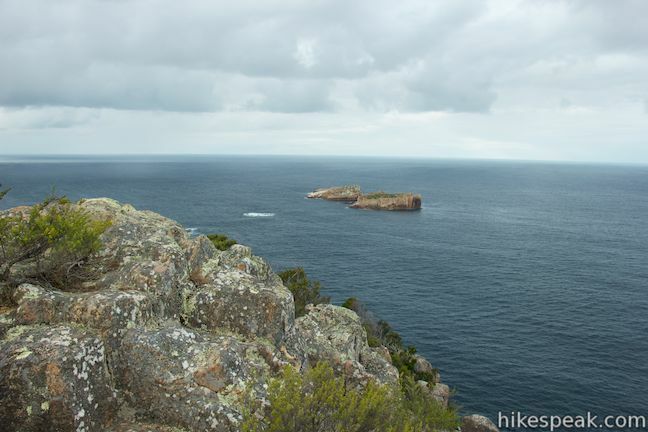 As you proceed around the cape, you’ll find more views looking east over a small cluster of rock islands sitting just off Cape Tourville called The Nuggets. 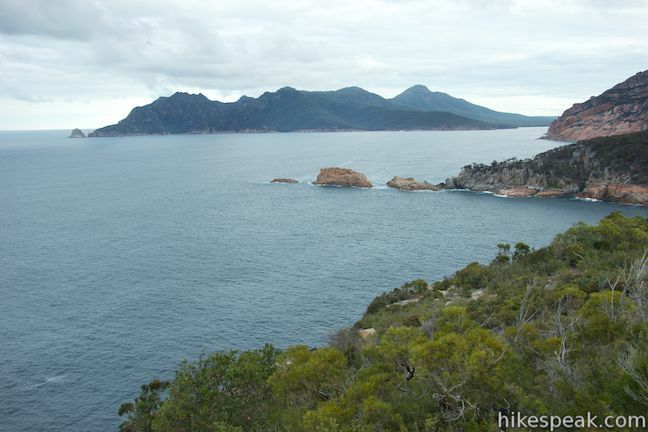 Rounding the cape even farther, you’ll discover views looking up the coast over more rocky headlands toward the Friendly Beaches north of the Freycinet Peninsula. 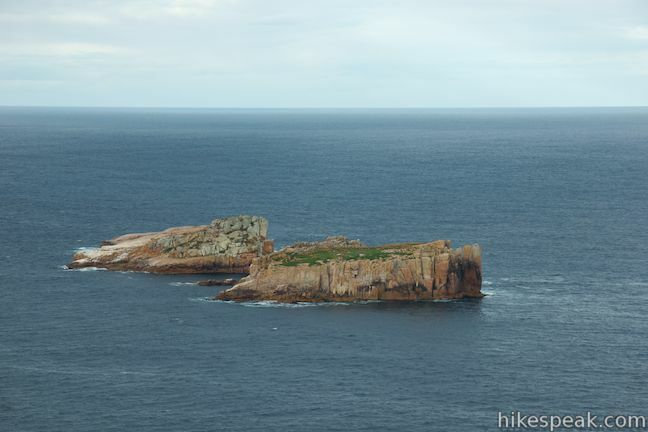 A short spur to an overlook on the right delivers the best views north, along with a final look south down the peninsula. 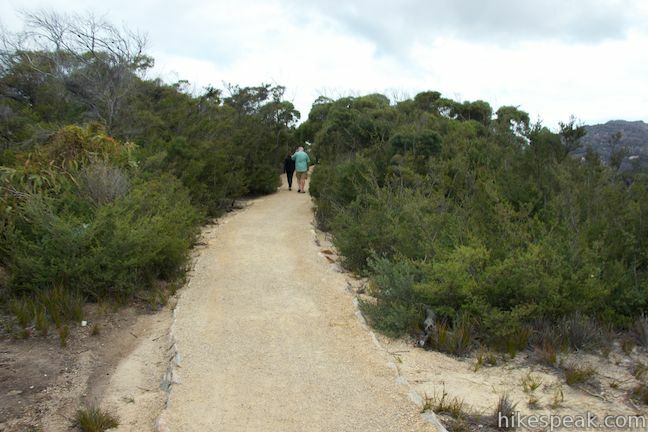 After this final overlook, the dirt trail moves away from the coast and back toward the car park, completing the short, scenic loop. 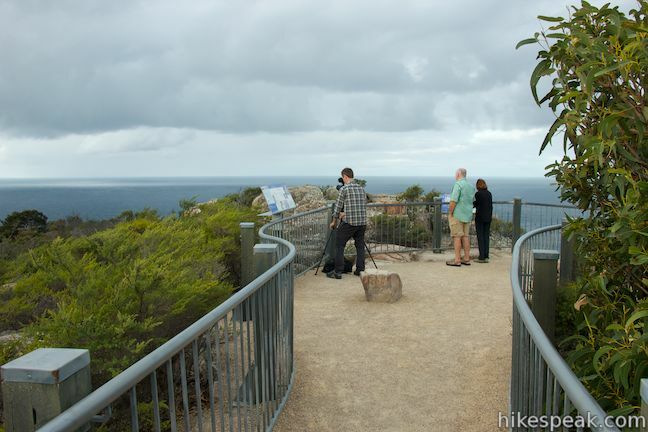 Dogs and bikes are not allowed on this wheelchair-friendly walking track. 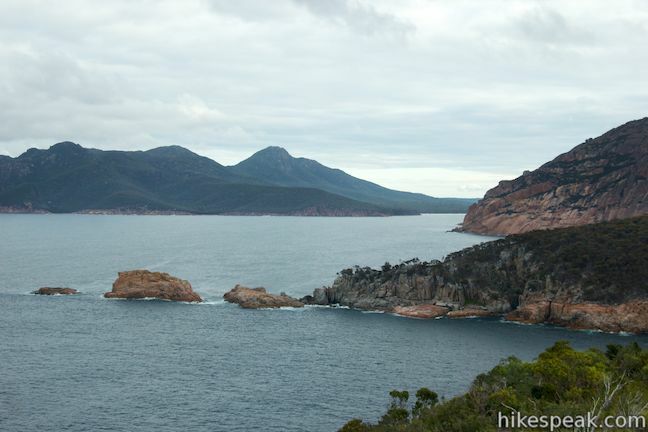 A national park entrance fee is required to visit Freycinet National Park. 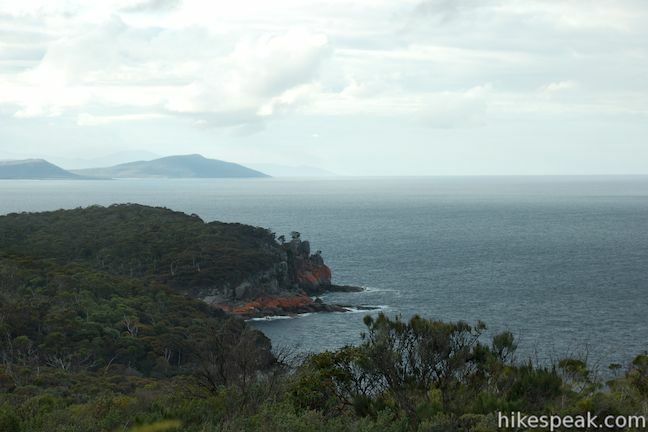 A single day pass will cost $24 or you may purchase an 8-week pass good for all of Tasmania’s National Parks for $60 (all prices in Australian Dollars as of 2017). Directions: Take Tasman Highway (A3) 11.3 kilometers south of Bicheno to Coles Bay Road (C302) and take this road southeast toward Coles Bay. 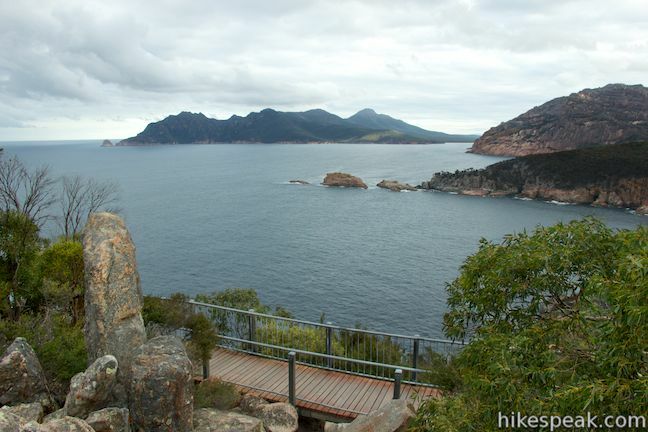 After 26 kilometers, pass through the town and continue straight into Freycinet National Park. 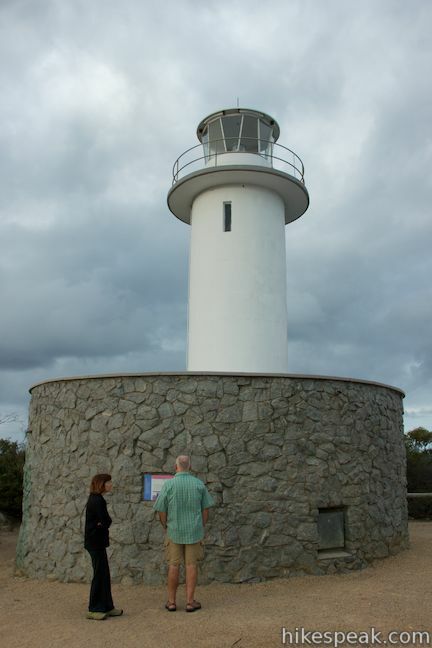 Pass the visitor center after another kilometer and proceed 1.5 kilometers to Cape Tourville Road. Turn left and drive 5.5 kilometers to the car park at the road end. 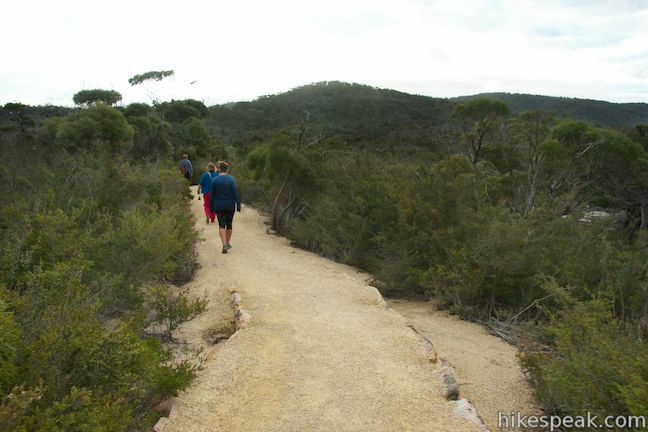 This approximately 12-kilometer loop (shorter if you skip two overlooks and longer if you do extra beach strolling) takes a rewarding route through Freycinet National Park, visiting pristine light sand beaches at Hazards Beach and the renowned Wineglass Bay. 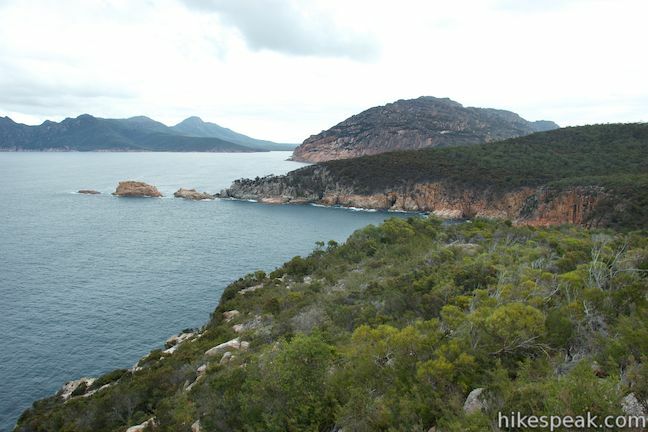 This bay side campground near Coles Bay offers powered and non-powered campsites in Freycinet National Park. 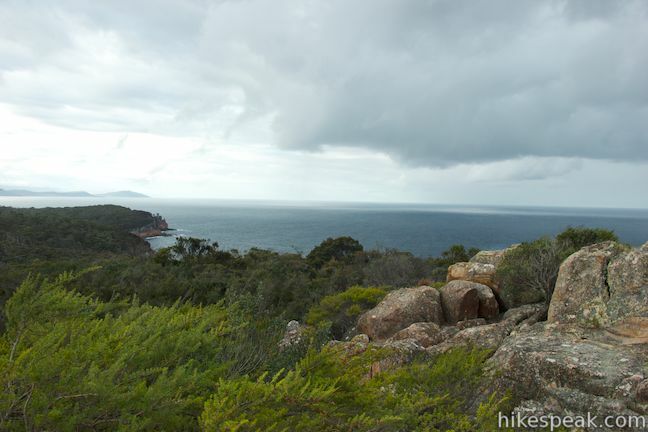 This primitive campground offers oceanfront camping surrounded by beautiful beaches in Freycinet National Park. 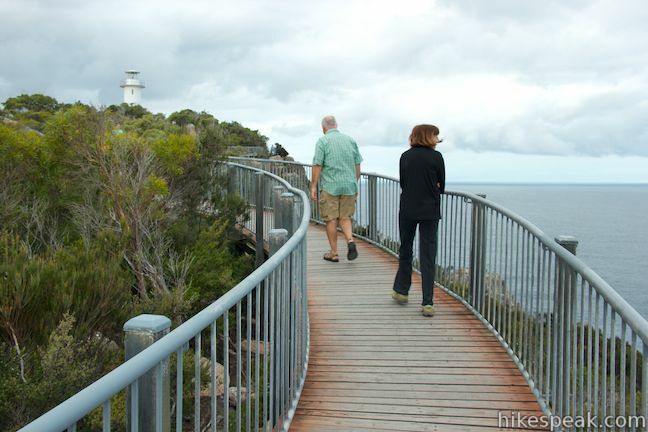 This holiday park in the coastal town of Coles Bay at the top of Freycinet Peninsula offers tent sites, campervan sites, and cabins, as well as quick access to nearby Freycinet National Park. 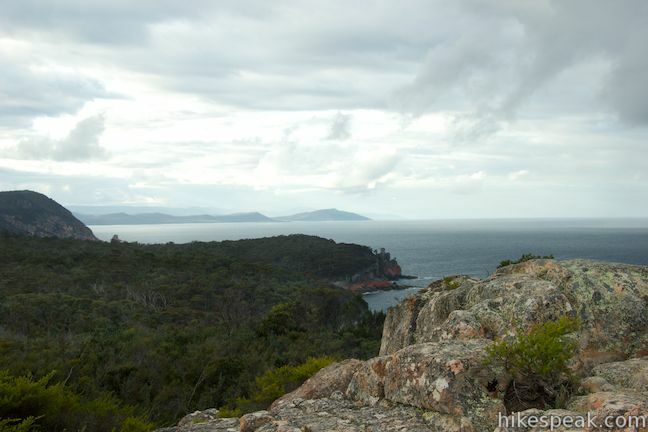 This beachfront campground is located on Great Oyster Bay on the east coast of Tasmania.